It's no secret that I am a fan of Hermès as a brand. I collect their scarves and bags. I have two iterations of the Slim d'Hermès, and what some might refer to as a ridiculous watch strap collection (and started the #hermesstrapclub hashtag to boot). It's also no secret that I love the moonphase complication - it's utterly useless in my day-to-day life, but there's something both a little romantic and a little nerdy about knowing exactly what phase the moon is in at any given moment. Combine the two and you have something I am obviously going to like. But there is way more to it than that with this watch. First, the movement. 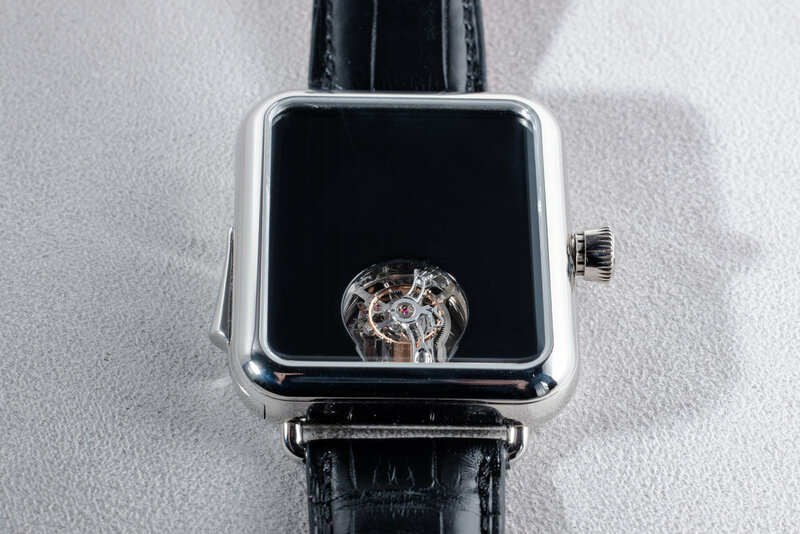 Hermès worked with Jean-Francois Mojon to develop the all-new, patent-pending H1837 caliber. 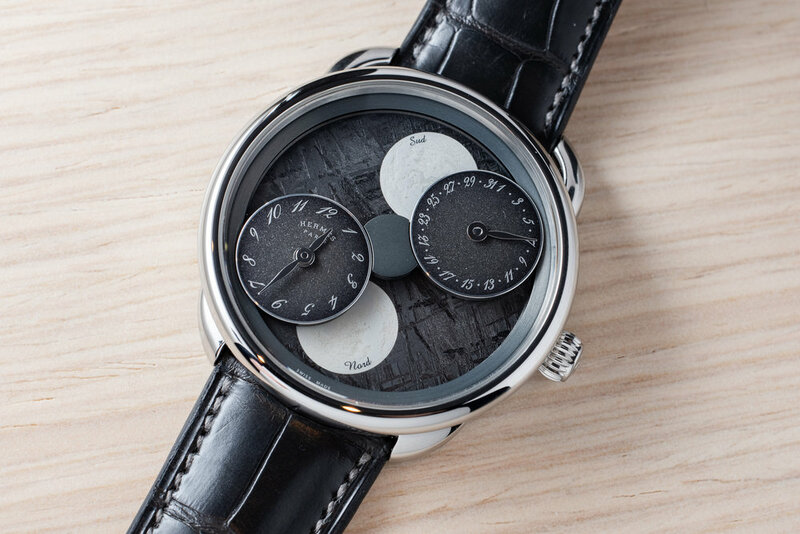 Instead of a moonphase disc that moves, the moons on the dial stay in fixed locations, representing the view of the moon from the Southern Hemisphere at the top of the dial and the view from the Northern Hemisphere at the bottom of the dial. (Should that be confusing, they are marked “Sud” and “Nord,” which are south and north in French, respectively.) As the days go by, the time and date dials move clockwise around the watch, covering and uncovering the moons as they change phases. The design of the watch is typical of Hermès, whose attention to detail is consistently impeccable. From the selection and angle of the font to the choice of meteorite or aventurine for the main dials, this is a straight-up beautiful watch even if you disregard its inventive and whimsical take on the moonphase complication. At 43mm, the case may seem large to some, but thanks to the unique lug design on the Arceau line, it wears smaller and can accommodate a variety of wrist sizes. I love it. My jaw dropped and I let out an audible "holy sh*t" when I saw this piece in the press presentation at Vacheron Constantin. Not only is it a beautifully finished perpetual calendar as one has come to expect from this brand, but it has two balances that oscillate at different frequencies, giving it an astonishing 65-day power reserve when it is set to the 1.2Hz frequency. Yeah, I said days. Not hours. Sixty-five days. This watch accomplishes some technical feats that are groundbreaking and best explained by our pal Jack Forster in his excellent in-depth article about how Vacheron Constantin achieved this impressive milestone here. When you're creating a relatively simple three-hand watch, the finishing and dial details need to be perfect. I near-shouted “Wow!” as the mildly startled but still good natured Tim Grönefeld handed me this watch, and I gazed upon the stunning dial. Salmon dials are having a moment right now and there are a number of beautiful examples I could point to, but this dial is an absolute showstopper. It shimmers with depth and texture. I could probably have stared at it for hours, if Atom & Adam hadn’t practically dragged me out of the booth. At 29,950 Euro for the stainless steel version with the gorgeous movement finishing that is typical of a Grönefeld piece, you are getting into an independent brand with serious watchmaking chops for a pretty decent value. Besides, every watch comes with a smiling Grönefeld brother! This one-off piece was so weird, how could I not love it? No hands and an empty black dial with just the tourbillon showing. The only way to tell the time is by activating the minute repeater. But how do you a set a watch with no hands? Do you just chime it and turn the crown and hope for the best? Nope. Moser has cleverly added graduated markings on the crown. A certain amount of crown rotation based on the markings will give you the exact timing you are looking for. It's a clever way to solve this rather odd horological problem. Baume came out with their Baumatic line last year, consisting of their in-house movement with a 5 day power reserve, in a simple and smart looking case for not a lot of money (relatively speaking, of course). This year, blue dials continued to trend with Vacheron and AP both having high-end blue dial models introduced at the show. Seeing the COSC-certified blue gradient dial on the Baumatic this year gave me hope! Not every watch with such a beautiful dial needs to be expensive. At under $3k USD, this is a lot of watch for a reasonable asking price. While I usually do not closely follow the world of Richard Mille, I was pleasantly surprised by the Bon-Bon collection. It’s colorful, fun, and a bit silly. If you think about it, there are few high-end watch brands coming out with anything less than ultra-serious watches. To see these come out at the asking prices of $120-150k managed to put a big candy eating grin on my face. In addition to the fun factor, they’ve got real material evolution going on with ceramic and titanium used in a way that makes the dials almost seem edible. If everything else has already been done, why not do something unexpected? The Baume et Mercier Clifton Baumatic with blue dial. The Baumatic is a solid value proposition already, with an in-house caliber offering a 5 day power reserve and silicon balance spring, and a solid dial design with applied indices. It's packing a lot of punch for the price point. The addition of the blue gradient dial was what sealed the deal for me - I love blue dials, and this one is executed beautifully. It's very likely to end up on my wrist when it's available later this year. 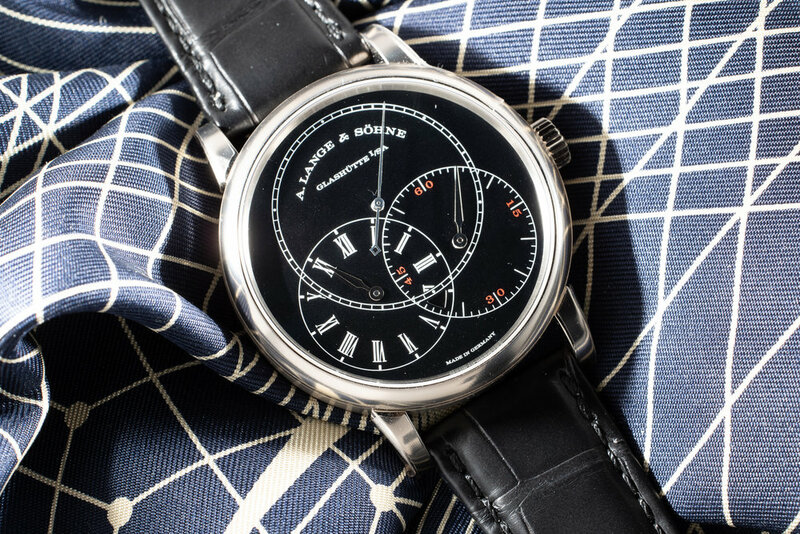 A. Lange & Söhne Richard Lange Jumping Seconds with black dial. Let's be real - this probably will not end up in my personal collection anytime soon since I'm just completing a renovation on a NYC apartment and am therefore juuuuust a bit light on cash. But when I put this on my wrist, I felt that little flutter in my heart that all watch collectors find familiar. One day, it will be mine. The aforementioned Hermès Arceau L'Heure de la Lune, given that they clearly sent a probe into my brain to decipher exactly what features would appeal to me in a watch and then manifested it in physical form. The Grönefeld 1941 Principia is one I would add to my own collection. Audemars Piguet, whether you love or hate the new Code 11.59 line, really took a risk by designing something outside of their Royal Oak comfort zone. The line was certainly the talk of SIHH, and the internet weighed in mostly on the negative side (an opinion I don't 100% share, but more on that later), but I absolutely respect their chutzpah and grace in handling feedback that was at best uncomplimentary and sometimes downright mean. Vacheron Constantin demonstrating their technical chops and innovative spirit that makes them one of the best in the business. Sixty. Five. Day. Power. Reserve. If that isn't the mechanical watch equivalent of a mic drop, I don't know what is. The Vacheron Constantin Traditionelle Twin Beat Perpetual Calendar shows the true innovation of design and ingenuity they are capable of.